These cupcakes are delicious and very indulgent. 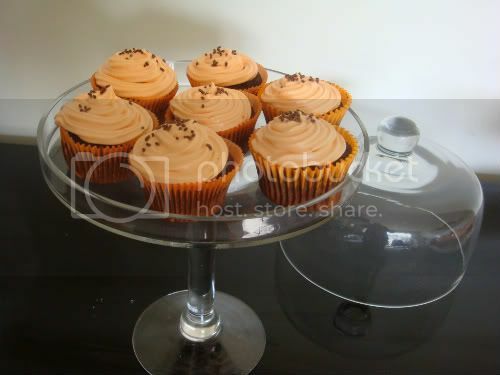 They are fabulous as a dessert cupcake or even for a nice afternoon tea. Preheat oven to 180 degrees C and line two muffin trays with cupcake cases. Sift together flour, cocoa powder, baking soda, baking powder and salt and set aside. In a large bowl, cream together butter and sugars until light and fluffy. Alternating in three additions, beat in the sifted dry ingredients and milk at a low speed, starting and ending with the flour. Fill muffin tins about half or three quarters full and bake for 15-17 minutes or until a skewer inserted comes out clean. Cool completely on wire rack before icing. In a large bow, beat together cream cheese and butter until well combined. Add orange zest and orange juice and mix. Sift icing sugar into a large bowl and add to butter mixture one cup at a time. Add colouring if desired and pipe onto cupcakes.